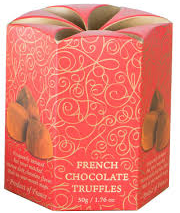 Our beautiful red and gold tulip petal box proved so popular, with fabulous cocoa-dusted truffles packed inside each box. Our beautiful red and gold tulip petal box proved so popular, with fabulous cocoa-dusted truffles packed inside each box. The famous French Guyaux label on the box will show that you know about chocolate and you care to give the best.